I am a fly by the seat of my pants traveler. I booked a trip to Portland and hadn’t planned a thing. The night before I left my conference in San Jose for Portland I met Lucy, who told me about an app called Sygic which proved to be incredibly helpful in coordinating my trip. 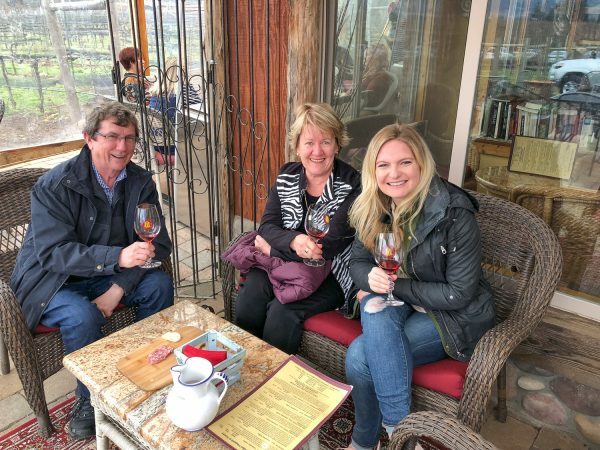 The app lists places to go and tours to take, which is what led me to discover a Wine and Waterfall Tour – it sounded like the most delightful way to spend a day. 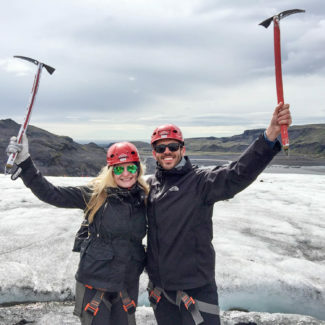 The eight-hour tour combines hiking, photo opportunities, and wine tastings. The small bus picked me up at 9am at my hotel and I joined an Australian couple for the tour. 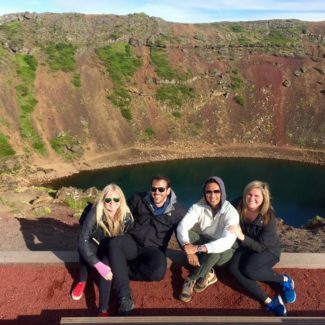 The tour is perfect for people who want to combine a nature adventure with drinking wine. This is one of those blog posts where the photos (and video!) will tell the story far better than words can. 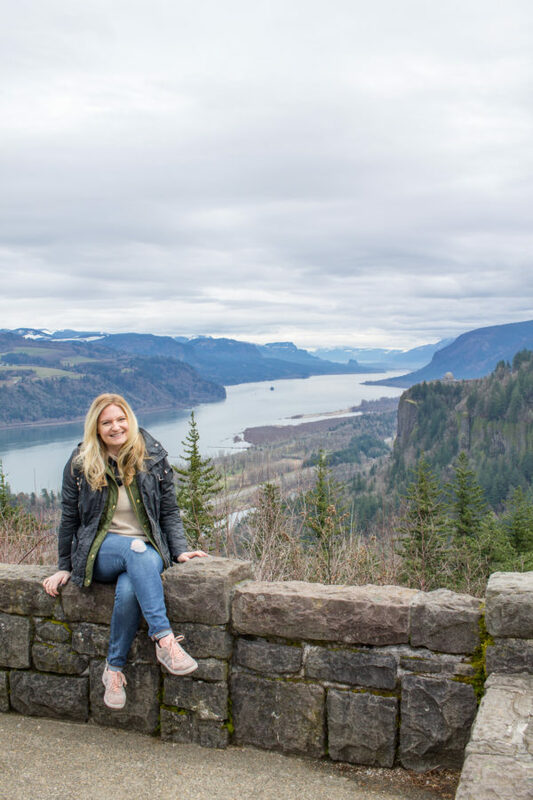 The day began with a 45-minute drive out to a Columbia River Gorge view point, which is simply stunning. 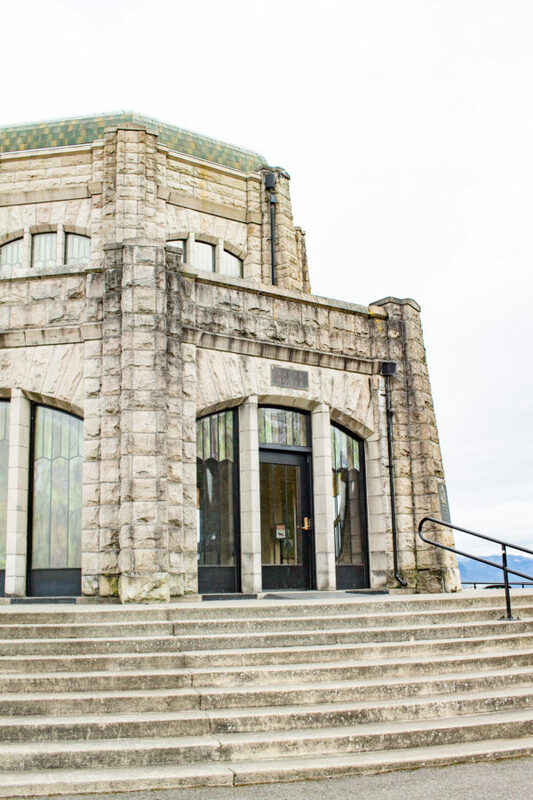 Next we took the short drive to Crown Point, a State Park with an observatory overlooking the Columbia River Gorge. Our tour guide described the observatory, the Vista House, as a beautifully designed rest stop. 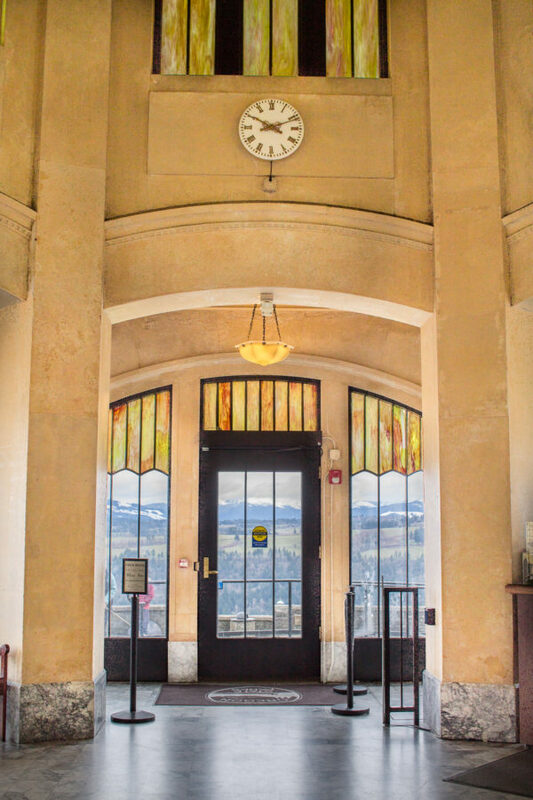 The interior of the Vista House at Crown Point is more impressive than you may expect. It has stained glass windows and stunning architecture. 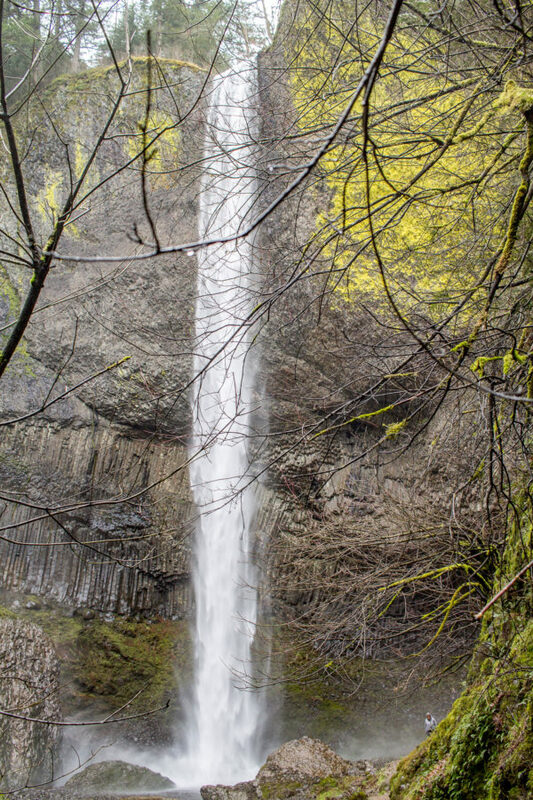 Then it was time to head to our first waterfall, Latourell Falls. It was a short hike to the waterfall which is in the woods. It was a quick and easy walk to reach the falls which toured over us. Or, if you don’t want to walk to the falls, there is a view point just off the road. 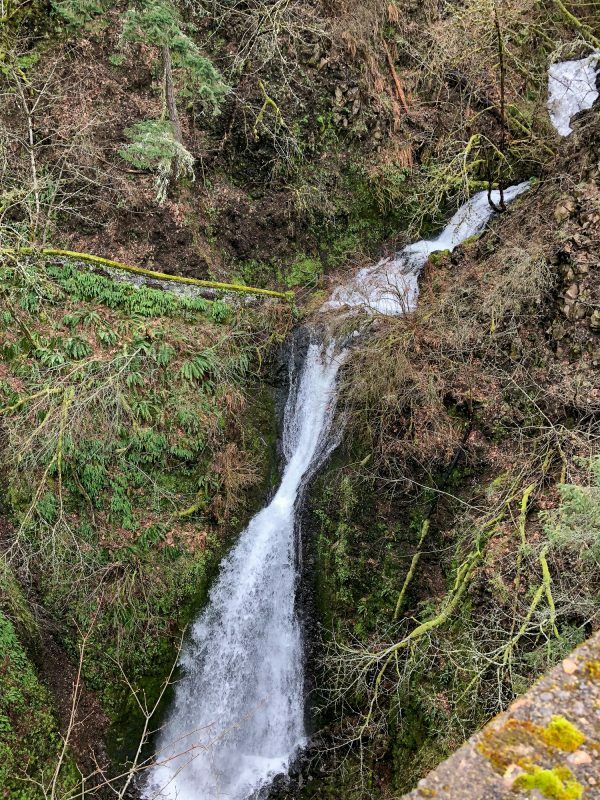 Shepperd’s Dell wasn’t as impressive as Latourell Falls, but it was worth the quick stop. A bridge takes the road right over the waterfall, so we just quickly pulled over and walked over the admire the falls before continuing on our journey. Bridal Veil Falls was next. This waterfall required a very brief hike from the parking area. 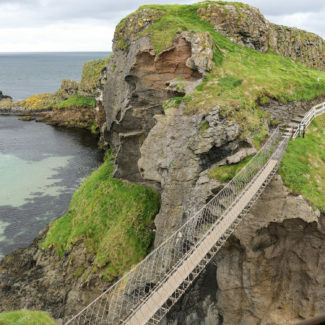 There are also some hiking trails to explore if you want you hang out in the area longer. Our trip was stop because we had more falls to see, and wine to drink. 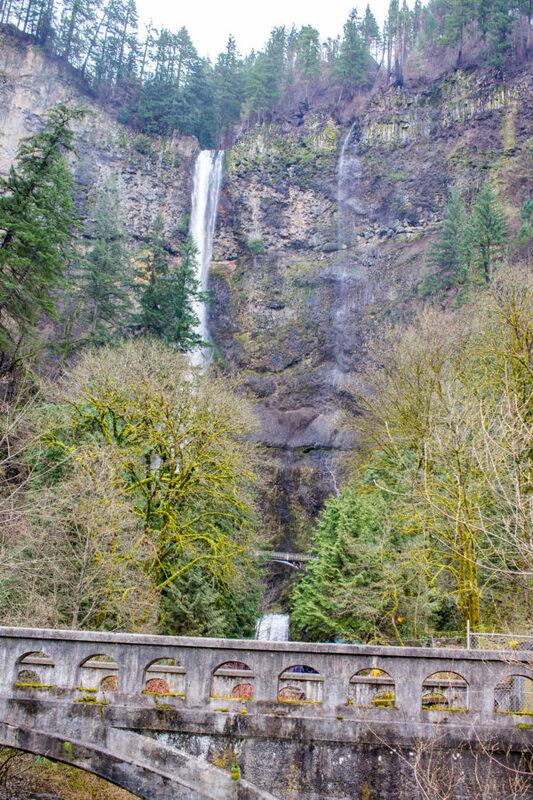 Multnomah Falls is one of Oregon’s most famous waterfalls. 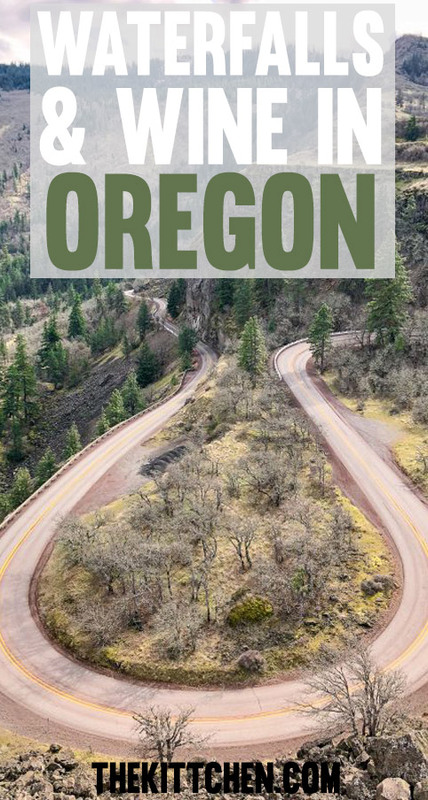 It is Oregon’s largest waterfall, and it is famous for its scenic bridge. 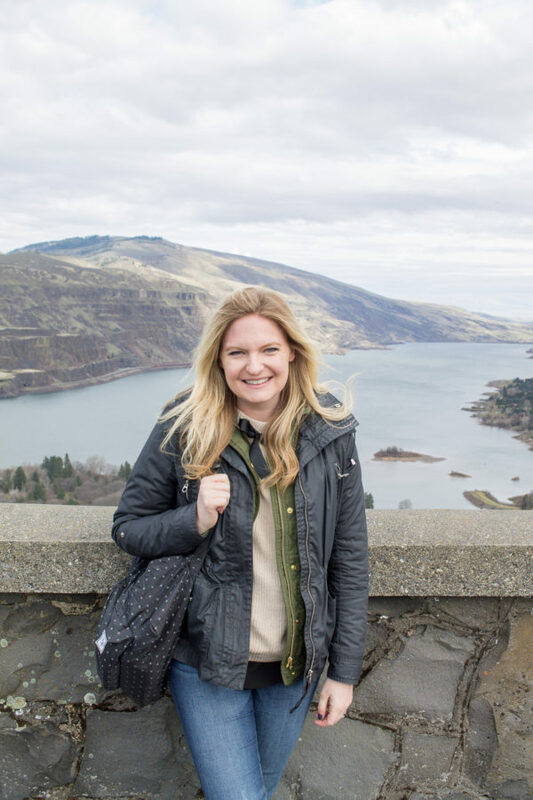 It is the most visited natural recreation site in the Pacific Northwest drawing in 2 million visitors each year – so I imagine it would be busy during warmer months. Sadly, this area suffered a considerable amount of damage during the September 2017 wildfires, and much of the area is closed to the public. You can still view the falls from afar, but the fires destabilized the land at the top of the falls so you can’t get very close to the waterfall. The area is under construction, and this has certainly diminished the experience. 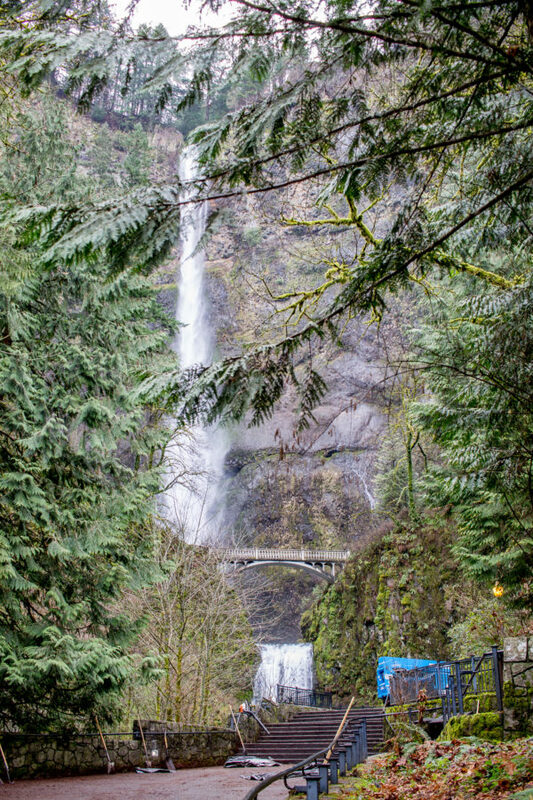 So if you are going to see Multnomah Falls, you might want to double check to see if the area has reopened first. 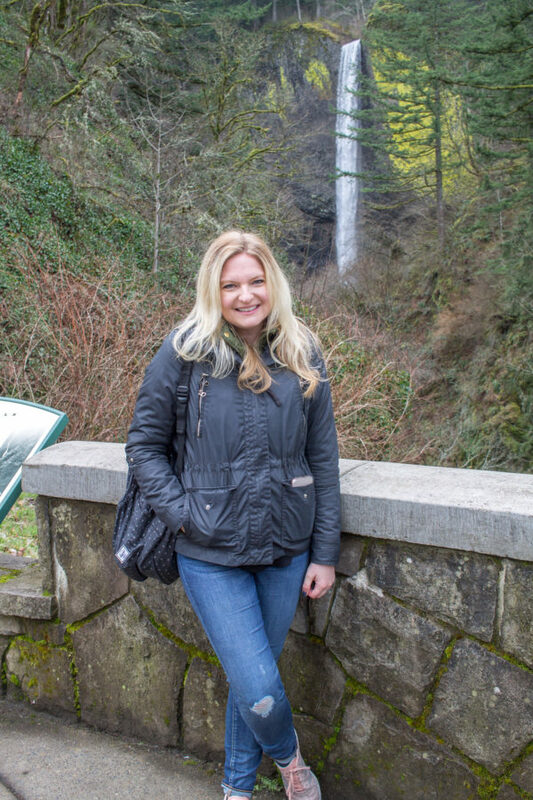 It wasn’t too much of a letdown for us because we got to see lots of beautiful waterfalls that day. 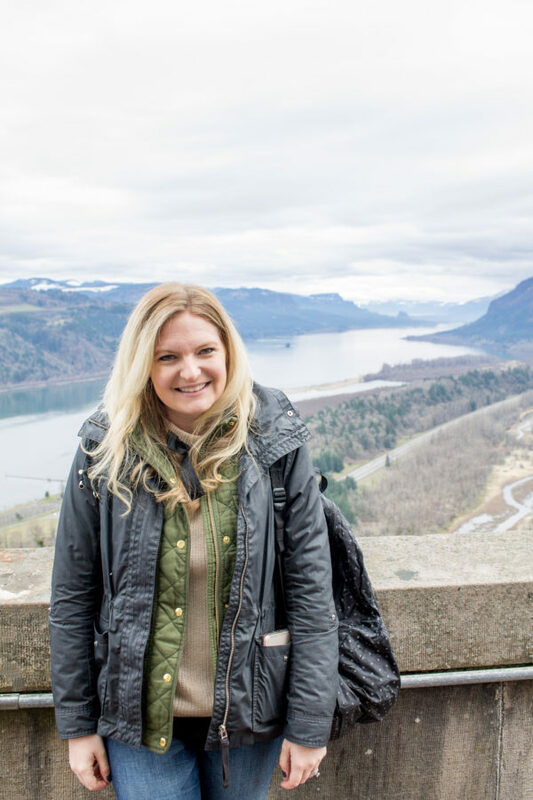 Our last nature stop was Rowena Crest, a hilltop view point that overlooks the Columbia River Gorge. On one side you can view the gorge. The other side has a massive cliff and a scenic U-shaped road. 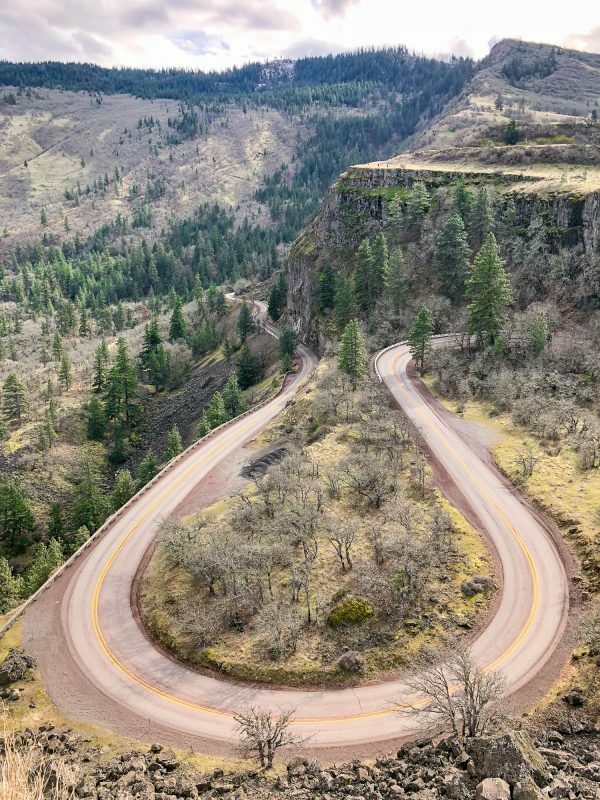 It is definitely worth making a stop at Rowena Crest. And there are hiking trails that start at Rowena Crest too. 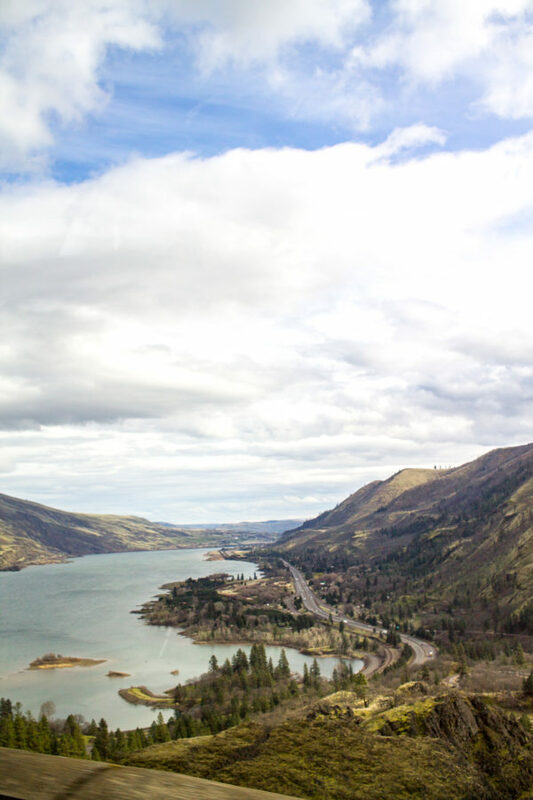 After taking photos at Rowena Crest, we shifted gears and headed towards the wineries. Hood Crest Winery was first. On a clear day you can see Mount Hood from the winery. The winery is owned by Tess Barr, a blues musician who I had the pleasure of meeting while I was tasting wine. 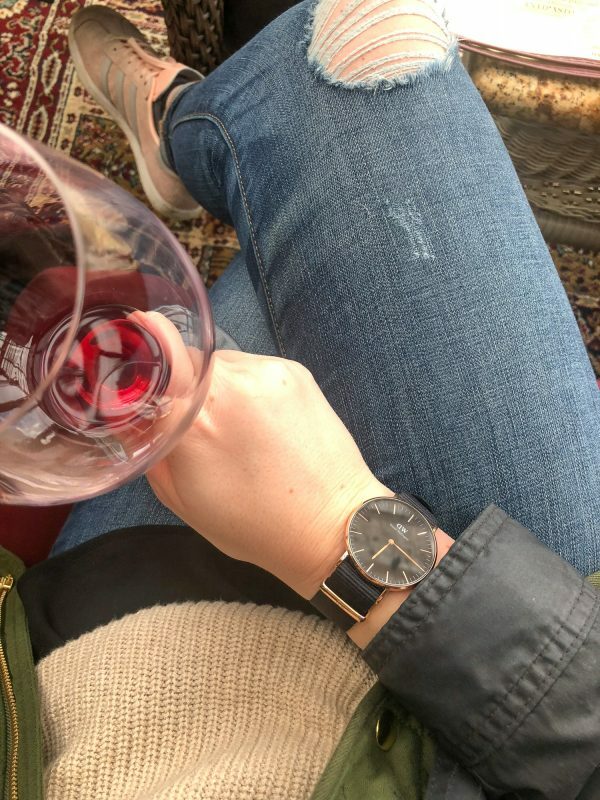 She prides herself on being a woman in a male-dominated industry, and she is making some really great wine. I had a flight of red wines, and I especially liked the Sangiovese. Our final stop of the day was Marchesi Vineyards, which is owned by Franco Marchesi who hails from Piedmont. Marchesi creates Italian style red wines, my favorite was the Amodomio. Overall, I will say that the Oregon wines are more mellow than the California wines. They are pleasant and easy to drink. 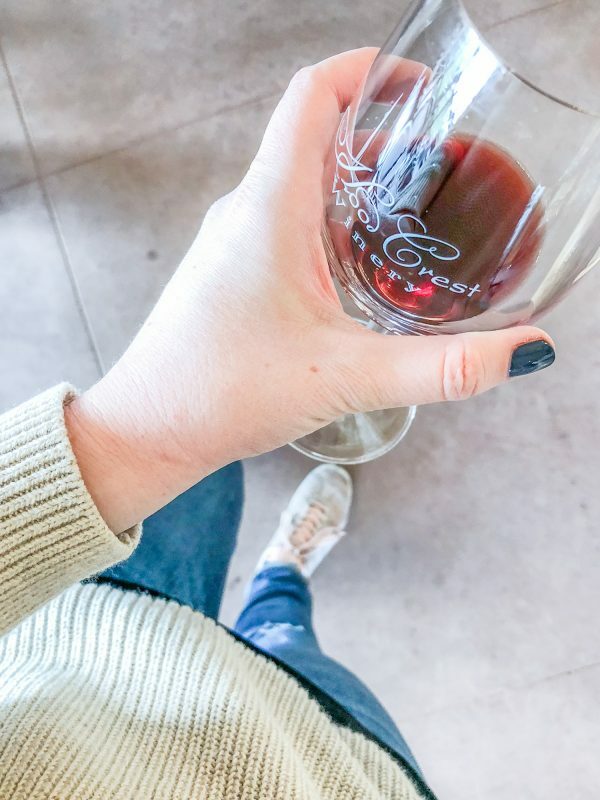 The wine portion of the day was the perfect compliment to a day spent out and about exploring nature. Can we talk about how Thelma and Dennis are the cutest? Their son has lived in the states for a long time, so they have come to the US and Canada many times and they have been everywhere. They have even seen the polar bears in Canada! 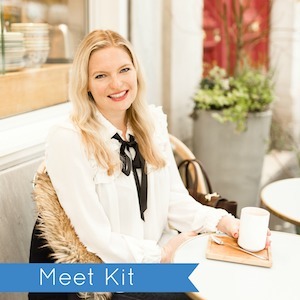 I was definitely taking notes and adding destinations to my bucket list as we chatted. I know that I had said this before, whenever I am traveling alone I end up meeting the nicest Canadians and Australians and I never really feel like I am traveling alone. 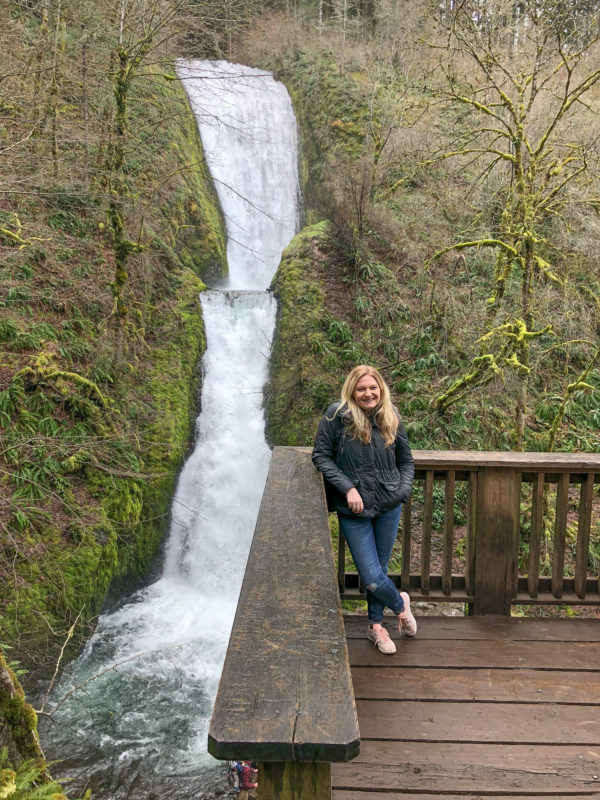 This Waterfalls and Wine Tour was amazing and you need to add it to your itinerary if you are going to Portland. Don’t be worried about the fact it will take up an entire day, it was the best day of my trip. Book the tour here. 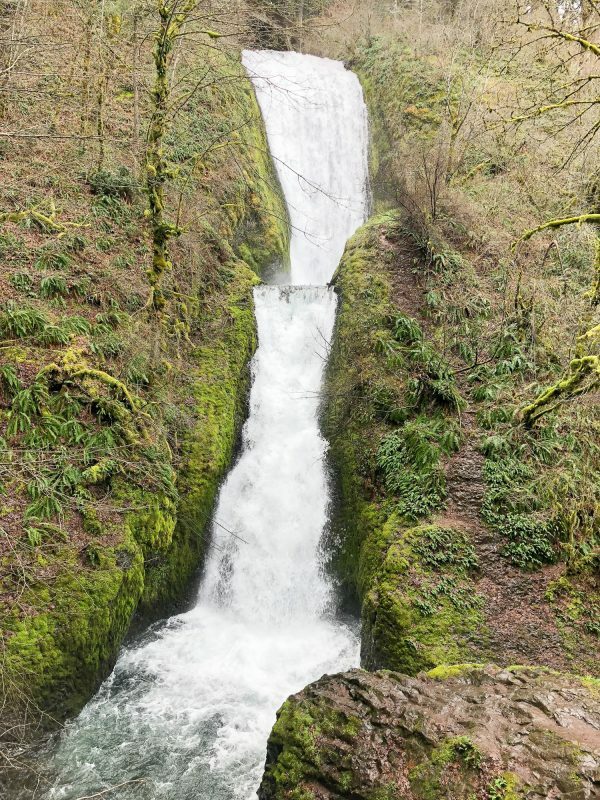 If you love hiking, you might want to spend a night or two in the Columbia River Gorge area. 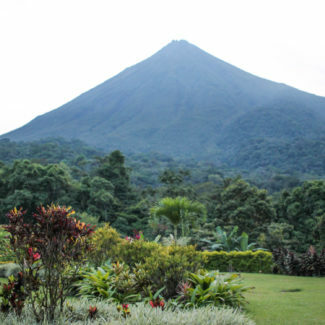 This way you can take advantage of the many hiking trails in the area. 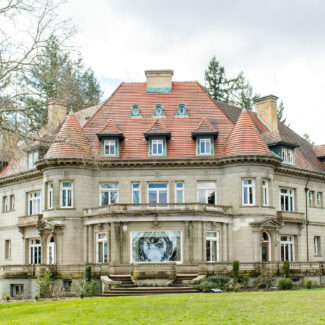 Or, you might want to stay in Hood River, which is an area famous for kite surfing. The Sygic app is really helpful. I paid $9.99 for the full version, which is a deal because it is like having a whole bunch of guide books in my pocket. 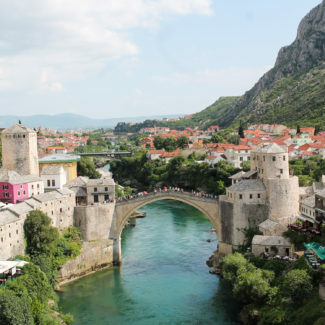 I like the app because as you add items to your itinerary it allocates the right amount of time for each thing – plus travel time between places so that you can accurately plan. This post isn’t sponsored. I just really loved the Sygic app and this tour!